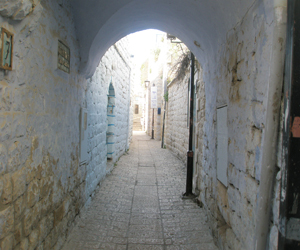 Jewish mysticism teaches that the Land of Israel has unique mystical qualities which set it apart from anywhere else in the world. In addition to being "the Holy Land" promised to the descendents of Abraham, Isaac and Jacob, Kabbalah explains that it is the most suitable place for attaining higher states of consciousness. In fact, it is written that the divine nature of the Land of Israel is such that it automatically prepares one's soul for spiritual growth. Israel is known as the primary place for receiving prophecy. Of all the Jewish prophets since the generation of the Exodus, almost all obtained prophecy only while in the Holy Land. In addition, while much Kabbalah has been studied outside of Israel during our prolonged exile, undoubtedly the greatest revelations occurred in Land of the Israel, particularly the transmission of the Zohar (2nd Century A.D.) and the revelations of the Arizal and his contemporaries in Safed (16th Century). While we lack the capacity to fully receive prophecy today, divine insights are still readily available to those whose prepare themselves through study, prayer, purity and perfection of character traits, especially in the Land of Israel. It is taught that merely stepping upon the soil of Israel boosts one's access to higher consciousness. In fact, the Talmud states, "The air of the Land of Israel makes one wise." Many already advanced Jewish mystics, such as the Arizal and Rebbe Nachman of Breslev, stated that, as developed as their knowledge had been before coming, their entire perspective in Torah was greatly altered after their arrival in Israel. A great many people in our generation, too, even on a temporary visit to Israel experience a heightened sense of inspiration and insights into life and its meaning. In the language of the Kabbalah, this can be attributed to Israel's inimitable place in the fabric of Creation. In brief, Jewish mysticism speaks of four levels, called "Worlds", in the makeup of existence. While the vast makeup of the physical world we know and experience is related to the most corporeal of the four worlds, called Asiya (or the World of Action), the Land of Israel corresponds to an entire new level, the ascendant world of Yetzirah (or World of Formation). An earthly connection to the even more elevated world of Beriya (or World of Creation) is only to be found on the Temple Mount in Jerusalem, and the most lofty world of Atzilut (or World of Emanation) has no place on the physical plane which relates to it.